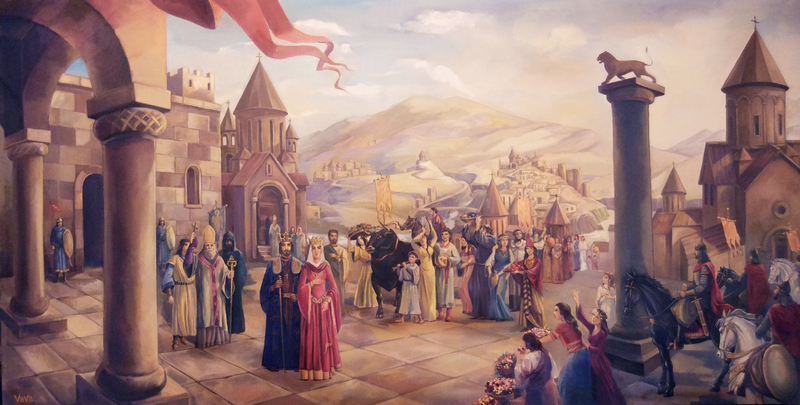 With the decline of the previously ruling Mamikonian dynasty, the Bagratids emerged as one of the most powerful noble families in Armenia. Ashot I Bagratuni (Աշոտ Մեծ) was an Armenian prince of Bagratid lineage. The resilient character of King Ashot I, forged through the heroic national liberation struggle of 850–855, eventually made the 35–year old the Lord of Armenia in 855. Thus, thirty years of Ashot’s relentless endeavor for the restoration and international recognition of the Kingdom of Armenia was crowned with success. The Armenian kingdom, which had fallen some 450 years earlier, was restored thanks to Ashot’s herculean drive. Due to his brilliant diplomacy, the kingdom was reestablished without an initiation of a major war. Ashot I spent the last ﬁve years of his life as the sovereign of a revived kingdom and commendably passed down the torch of freedom to his successors.